Don’t have the time or inclination to set up your store? Knowing how to set up a theme for optimum conversion rate is something that most store owners simply don’t have experience to do. We’ll assist you by: creating your account, picking a theme for your brand, setting up your store, theme, and checkout process, and providing 30 days of support. Your point of sale should make your process more efficient, not less. 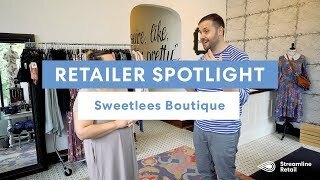 Our team works with you to make sure your system works seamlessly with BigCommerce and enables you to have a robust process that fits the pieces that are unique to you. Get a unique and professionally designed website – no generic templates! We will tell the story of your brand and products to create a shopping experience that converts. We are a certified partner for both Springboard point of sale and BigCommerce, which means we can be your single service provider for integrating the two robust tools for retailers. To be seen as a top competitor in your market, you have to look the part. Our designers and photographers can get you there with our branding services and store/product photography. Online sales slow? A full redesign or starting over with a new theme can be expensive. Don’t redesign your site. Revive it. Revive eCommerce, a design service by Streamline, is a more affordable, smarter approach to improving conversions on your eCommerce site. Reach more customers and get in front of them where they do most of their shopping. Consider these ecommerce trends from BigCommerce: - 51% of Americans prefer to shop online - 67% of Millennials and 56% of Gen Xers prefer to shop on online rather than in-store. - 96% of Americans with internet access have made an online purchase in their life, 80% in the past month alone - Ecommerce is growing 23% year-over-year, yet 46% of American small businesses do not have a website ::::: Ecommerce is essential for staying competitive. Our eCommerce experts can help you whether you are starting from scratch or if online sales have plateaued and you need to get unstuck. - Store set up and theme installation - Integration between online store and point of sale - Custom design and development - Ecommerce platform migrations - Email marketing and automation - Navigation and category taxonomy audit - Conversion rate optimization - Strategy consulting - Maintenance and support ::::: We are retail experts that will help you master all aspects of your business. Unlike other agencies, our expertise addresses all of the unique challenges that retailers must face to run a business – including point of sale, eCommerce, payment processing, network support, and inventory control.